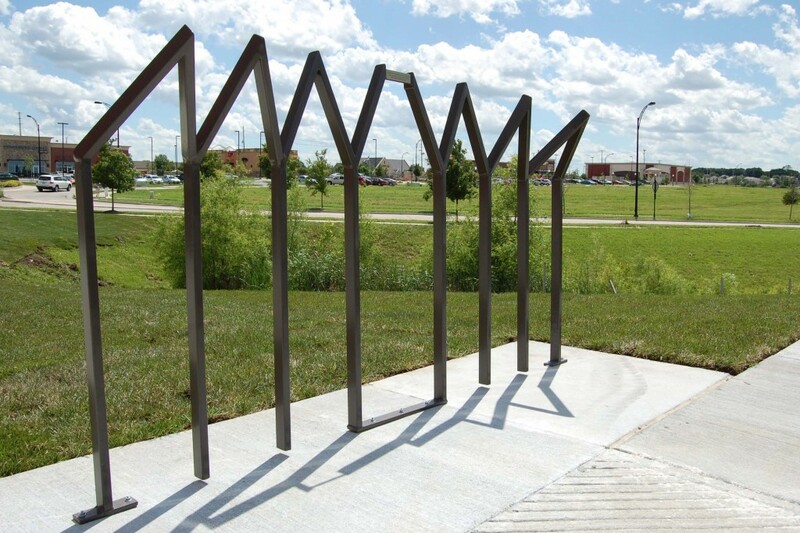 The Lawrence-Douglas County Bicycle Advisory Committee has invited local biking enthusiasts to celebrate the installation of five bike repair stands, two bike corrals, and twenty-two inverted U racks as a result of a LiveWell Lawrence Community Wellness Grant. 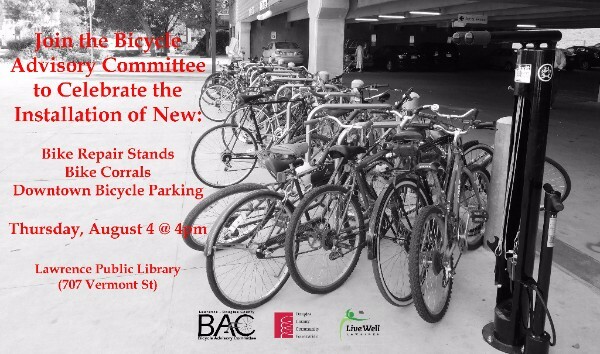 These facilities will provide accessible repair stands for bicyclists to make repairs or adjustments as well as additional secure bicycle parking downtown. Visit www.lawrenceks.org/lprd/bike to view the other new bike repair stand locations. The celebration is scheduled for 4:00 p.m. on Thursday, August 4, in front of the parking garage at the Lawrence Public Library, 707 Vermont Street. Lawrence is a Great Place! February 13, 2014 / / Comments Off on Lawrence is a Great Place! 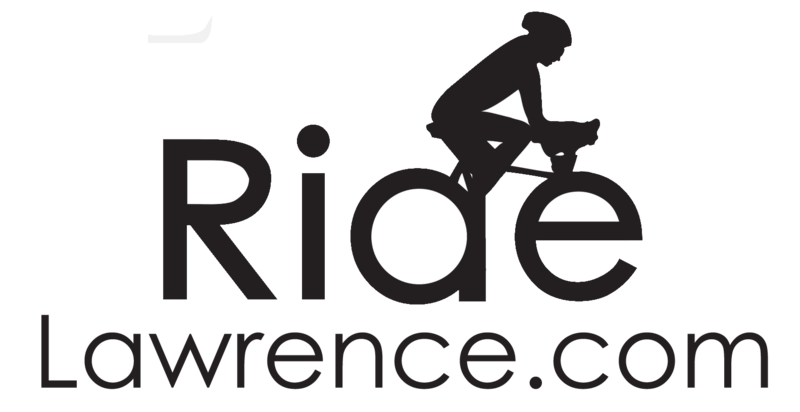 The Lawrence Chamber of Commerce put together a great video of why people love it here in Lawrence and one of our own Ride Lawrence bike racks is featured at the 1:02 point! 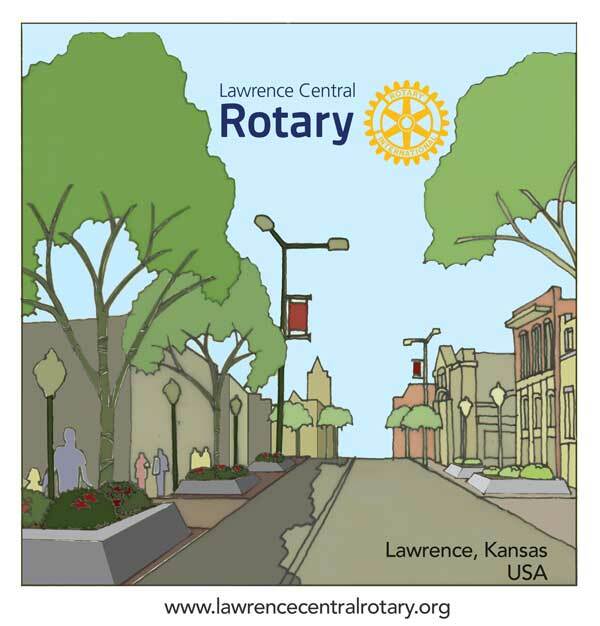 As a part of their biking initiative Lawrence Central Rotary (who sponsors and runs Ride Lawrence ) identified bicycling as an avenue to a healthy lifestyle. To that end we not only sponsor the yearly Community Bike Ride, but we also have raised thousands of dollars to fabricate and install bike racks around Lawrence. We’re happy to share that the latest creation was unveiled recently at the new Theatre Lawrence building on Lawrence’s west side. 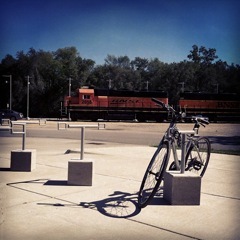 Even the bicycle racks for the new Theatre Lawrence have a theatrical theme. The city requires bike racks to be installed for new construction. and rather than purchase generic racks for a very un-generic building. the theatre sought out Lawrence blacksmith artist Kate Dinneen to design something more appropriate for the theatre’s beautiful new building. Kate Dinneen admiring her vision installed. 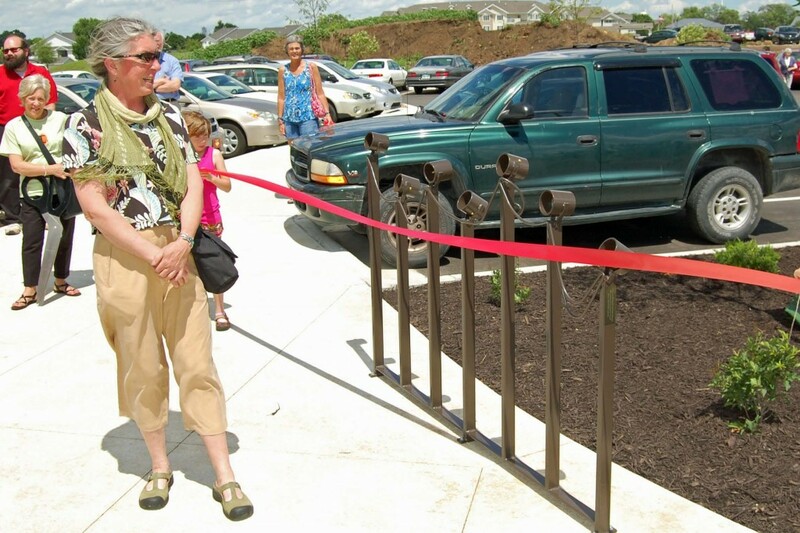 Kate, an artist both in a blacksmith forge and also in a symphony orchestra, graciously donated her time and talent to design and fabricate two metal bike racks for Theatre Lawrence. One suggests actors holding hands and bending forward in a company bow at the end of a performance, and the other is a representation of theatrical spotlights on poles. 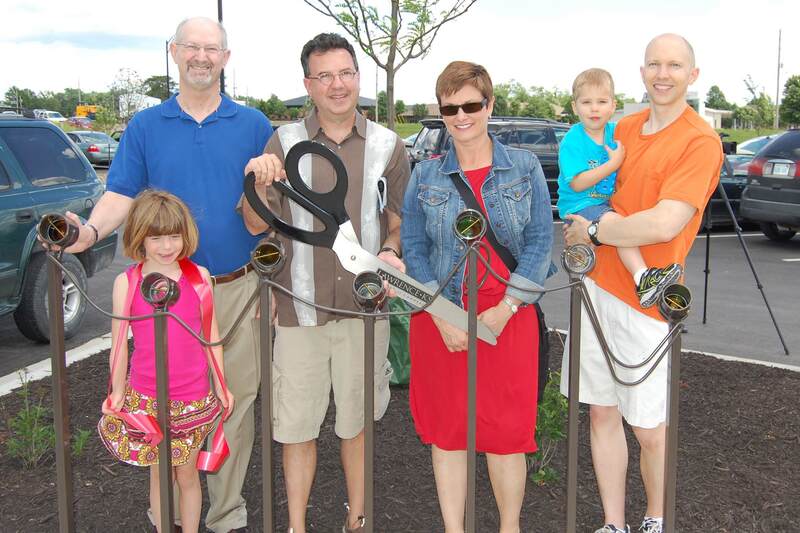 The Lawrence Central Rotary Club generously donated the materials, powder coating and installation for the project. Thanks to the interest and participation of Kate Dinneen and Lawrence Central Rotary, the theatre has pieces that not only are fully functional bicycle racks, but also are pieces of sculpture that add to the exterior beauty of the new building . hands and bending downward in a company bow at the end of a performance. Lawrence Central Rotary members (R-L) Lynn O’Neal, Eva Wagner, Scott Wagner, Carolyn DeSalvo, Steve Lane and his son Grant. 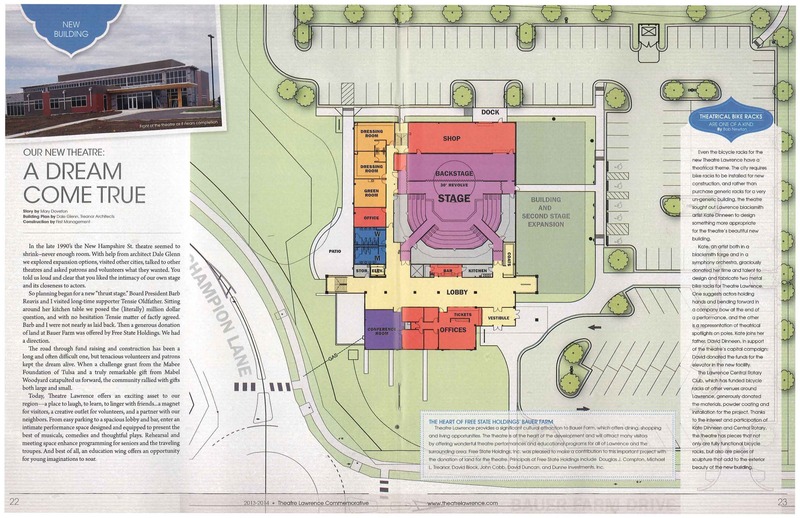 Scanned page from the event’s program talking about the building and the bike racks. Lawrence Central Rotary Club set to Unveil New Bike Racks at Van Go, Inc.
September 25, 2012 / / Comments Off on Lawrence Central Rotary Club set to Unveil New Bike Racks at Van Go, Inc.
Van Go, Inc. is this year’s recipient of an artfully designed bike rack sponsored by the Lawrence Central Rotary Club. 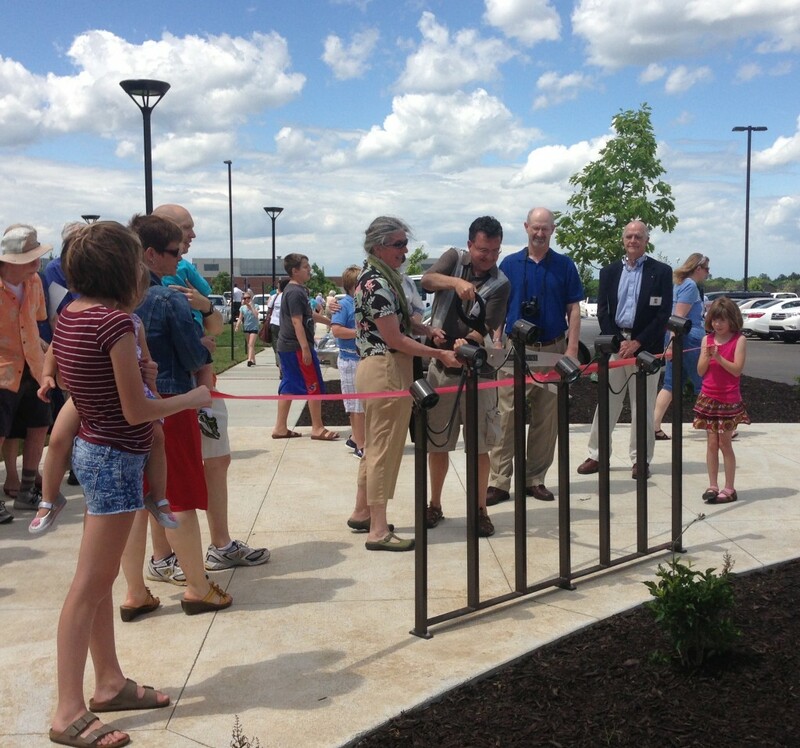 The ribbon cutting for the bike rack will be held Thursday, September 27 at 4 pm at Van Go, 715 New Jersey. The rack, funded by LiveWell Lawrence, was designed by Rockhill and Associates and was envisioned to complement the building’s architecture. 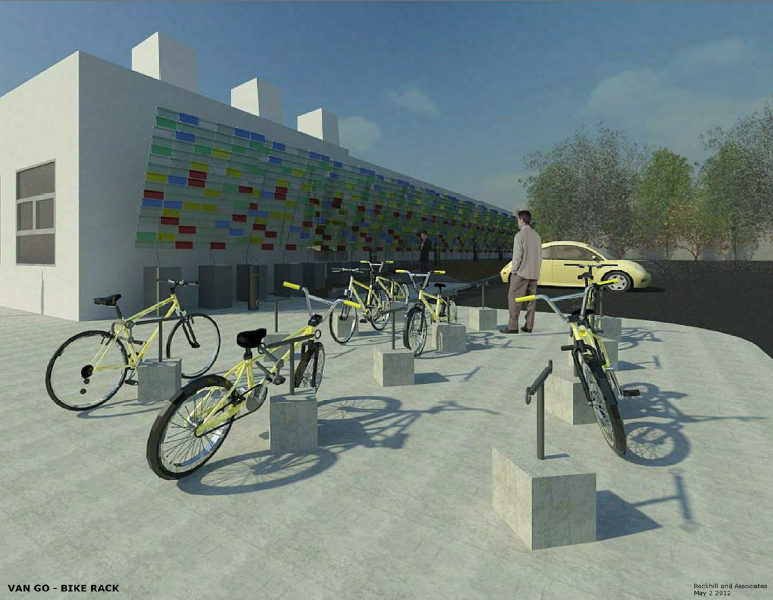 The racks include concrete bases with steel tops with to secure the bicycles. The design was fabricated over the summer and was installed in August. The new rack will be highly used by the Van Go’s teens, which frequently use bikes for transportation to and from their work at Van Go. Biking gives the teens independence as well as helping to instill healthy living habits. Lawrence Central Rotary Club Announces Bike Rack Competition Winner For Van Go, Inc.
June 12, 2012 / / Comments Off on Lawrence Central Rotary Club Announces Bike Rack Competition Winner For Van Go, Inc.
Lawrence Central Rotary Club announced Monday that a design created by Rockhill and Associates was selected as the Club’s 5th sponsored bike rack for the community. The rack, funded by LiveWell Lawrence, was designed to be installed at Van Go, Inc., 715 New Jersey Street, Lawrence, KS. Rockhill and Associate’s design was envisioned to complement the building’s architecture, and includes concrete bases with steel tops to secure the bicycles. The design will be fabricated over the summer and installed in early fall. Van Go, Inc. is an arts-­‐based social service agency that provides year-­round after-­school and summer job‐training programs to high-­needs and under-‐served youth, ages 14-­21. Lynne Green, Executive Director of Van Go met with Club President Shon Qualseth and bike rack chairperson Jane Huesemann to explain the reasons the bike rack would be beneficial. The new rack will be highly used by the center’s teens, which frequently use bikes for transportation to and from the center. Biking gives the teens independence as well as helping to instill healthy living habits.